A 20 minute indoor cycle ride which may include light hand weights (optional). Class then proceeds to Studio A for work on strength and abs. A variety of equipment is used in the toning segment of class. All fitness levels are welcome to attend. Press for time? Then this workout is perfect for you. A quick 30 minutes from start to finish. Burn some calories, engage your core and build some muscle in a multitude of cardio and strength exercises. All fitness levels welcome! Join us in this fun workout including many of our gym toys (stability balls, body bars, tubes and bands). The class is focused on building strength and balance in addition to core and cardiovascular endurance. Take a pair of drum sticks to a stability ball and what do you get? A super fun, invigorating, cardio workout that is an excellent calorie burner! This class is HOT..HOT...HOT and something you should definitely try. A strength segment and a relaxing cool down will be incorporated into classes that run longer than 30 minutes. All fitness levels are welcome. Class sizes are limited due to the number of stability balls available. A blend of cardio and weights with a primary focus on improving overall strength. Increase your muscle to rev up your metabolism while improving your agility and endurance. Modifications make this class suitable for all fitness levels. INTENSE conditioning through a variation of strength movements. Class utilizes equipment such as medicine balls, rings, bands, kettlebells and weighted sled. For intermediate and advanced levels. Take some time for Ahhhhhhh! Refresh your sore muscles and relax your mind in Body Refresh. This is a yoga based class that also includes stretching, balance and strength work. A great cardio workout that will help you release any pent up frustration. This class uses traditional non-contact punches and kicks mixed with a few martial art practices. No equipment is needed for this class. Beginners are welcome as low impact options will be shown throughout class. Kia! A fusion of class formats mixed all in one workout! Experience cardio, strength and ab exercises utilizing all kinds of gym equipment (balls, bars, bands, hand weights, paper plates and more). It is sure to get your heart pumping and your muscles strong and toned. Alternating stations of cardio and strength exercises. Exercises are timed by the instructors and last anywhere from 30-60 seconds before rotating to the next station. It sure keeps exercise interesting. You won't get bored, promise! Workouts will include a mix of isolation exercises (like crunches or leg extensions) that target specific muscles and integrated moves that use two or more muscle groups together. What to bring to class? A towel, water bottle, mat, plus a positive attitude and determination! We provide the resistance tubes. For the beginner it’s Gym Machine 101! For the more advanced, t’s Gym Machine Extreme. Learn how to incorporate basic strength training moves for each of your major muscle groups into your workout program by utilizing the gym machines, dumbbells, stability balls and more! This class takes place in the Fitness Center and runs 75 minutes (unless otherwise noted on the schedule). Cardio machines or exercises in Studio A are used for class warm-ups. Indoor Cycling is for everyone!!! All ages from beginners to the more advanced. Instructors will take time at the start of each class to address proper bike adjustments. Sit back, listen to the music and enjoy the ride! Make it right for your level of fitness by adjusting the resistance knob and controlling your speed. An average 45 minute class can burn 600-800 calories! Bring a water bottle and a towel Beginners welcome and encouraged to attend! A ride that will feature an 8 minute flat ride warm-up, followed by a 29 minute HITT ride including 30, 45 and 60 second bursts of speed/tension challenges with recovery breaks in between. Class ends with an 8 minute recovery ride/stretch. A 45 minute ride that incorporates hand weights or tubes into the workout. Members stay on the bikes during the toning segment. It's a great way to add active recovery after sprint work! Let's ride! Take this class for a total body high-energy workout! Jab Attack is based on Aerobic Kickboxing, which incorporates floor aerobics, punching and kicking techniques and a heavy bag. The class will also include leg and ab work. All fitness levels are welcome. Gloves or hand wraps are required for class. Not for individuals with back or shoulder issues. A full body workout in a fraction of the time! Pick up those ‘bells’ and pack on the benefits: core, strength, cardiovascular endurance, muscle tone and increased mobility. This non-impact workout will elevate your heart rate and simultaneously challenge many major muscle groups. Members are asked to BRING YOUR OWN KETTLEBELL. Suggested weight: Beginner (5-8lbs), Intermediate (10 – 12lbs), Advanced (15+lbs). Perfect For: Everybody and every body! Each class is designed to bring people together to sweat it on. How It Works: We take the "work" out of workout, by mixing low-intensity and high-intensity moves for an interval-style, calorie-burning dance fitness party. Super effective? Check. Super fun? Check. Benefits: A total workout, combining all elements of fitness, cardio, muscle conditioning, balance and flexibility, boosted energy and a serious dose of awesome each time you leave class. This class is great for beginners or someone looking for a low impact class that focuses on muscular strength and endurance. This class will utilize dumbbells, body bars, bands and more. 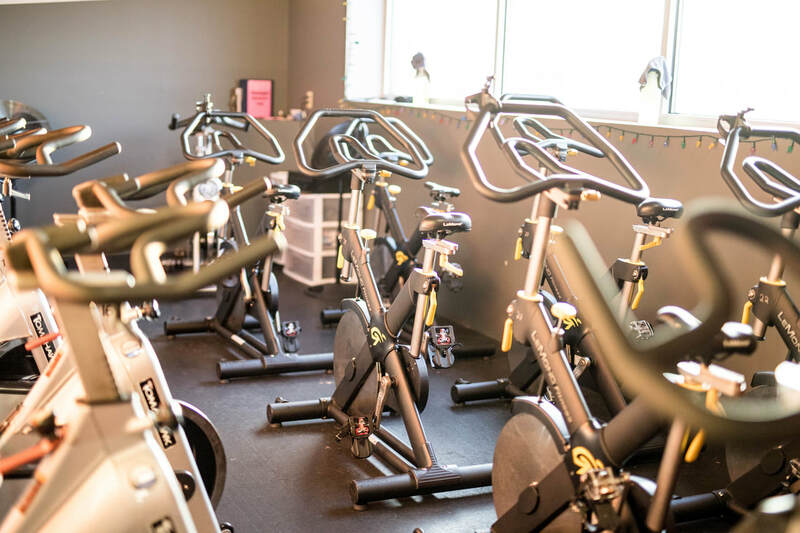 Gently move your body to some energizing cardio dance moves or basic floor choreography then tone and shape your muscles using our studio equipment. Class will end with balance work and a relaxing stretch. Low impact and paced just right to get your heart rate up and challenge your strength and balance. Join us! A challenging class that is designed to take you out of your comfort zone to help you achieve your weight loss goals once and for all! This class focuses on resistance training and conditioning of all major muscle groups. Exercises utilize your own body weight AND one or more of the following props: step platform, swiss balls, resistance tubing, dynabands, dumbbells, gym machines/equipment and weighted bars. A cardio workout is incorporated into class (may include outside jogging). A typical class format is as follows: begin with a warm-up followed by a cardio segment that gradually increases in intensity. Lower body stretch, then onto a strength segment, followed by abs, cool down and flexibility training. An additional cardio interval may be interjected following the strength segment. A popular workout for all fitness levels. Bring a water bottle and towel. A method to body conditioning using a unique system of stretching and strengthening exercise. It strengthens and tones muscles, improves posture, provides flexibility and balance, unites body and mind and creates a more streamlined shape. Participants should be in good physical health. Beginners are welcome. Pilates style class with a twist! Incorporating bars, balls and bands to strengthen the core, increase flexibility and balance plus tone targeted areas of the body. This barre-inspired class also uses chairs as props to balance while doing exercises that focus on isometric strength training. Combines the muscle-sculpting, core-firming benefits of Pilates with the strength and flexibility advantages of Yoga. We then crank up the speed to deliver a true fat-burning, low-impact workout that leaves your body looking long, lean and incredibly defined! We add in a short interval of weight for some additional strength training benefits! Please wear sneakers to class. This class is a great combination of your favorite step and strength training classes. A combined cardiovascular and strength training workout focused on maintaining your target heart rate throughout the class and incorporating resistance training and conditioning for all major muscle groups. Any one or more of the following may be incorporated into the class: step, cardio kickboxing, rope jumping, resistance tubing, dumbbells, stability balls and weighted bars. Class step choreography may be difficult for members brand new to step. Stuck in a plateau? Need to spice up your workout routine? Let our instructor help to get you PUMPED UP! A challenging 1 hour workout that will include mostly strength exercises. Show up and be prepared to work out of your fitness box and have some fun! This class focuses on relaxing long-held stretches combined with breath work. These poses stretch beneath the superficial muscles to target the dense connective tissues of the body, often in the hips, pelvis, and low back, which are difficult to open and can result in both limited flexibility and stagnant energy. Also worked are all major muscle groups (back, chest, biceps, triceps, legs). This class is gentle, yet intense, with the primary focus of getting the body and muscles to relax. All the basics of lifting, cardio, flexibility and abs for 50 + adults. No high intensity in this class! This low impact, joint friendly class will help you build muscle mass , reduce fat and increase flexibility. Class may involve chairs, tubes, hand weights and body bars. Classes are designed to increase flexibility, joint stability, balance, coordination, agility, muscular strength and cardiovascular endurance. (Interval Circuit Training) – Each class provides a variety of unique, targeted exercises by combining strength, resistance and low impact training with cardiovascular bursts of exercise for max results. Great for all fitness levels. Give it a try, you won’t be sorry! Tabata training is high intensity interval training designed to get your heart rate up in the anaerobic zone for short periods of time. The reason? This type of workout helps you burn more calories both during and after your workouts. Our classes alternate cardio and strength exercise segments throughout the class for a 24-30 minute period. It is recommended for the intermediate/advanced exerciser due to the speed of the workout and exercise movements. Stimulating for body, mind and spirit. Yoga classes will include either Ashtanga yoga primary and secondary series poses, or a Vinyasa flowing form that combines balance, strength and flexibility. Incorporates breath awareness with sun salutations and invigorating postures. Class will end with therapeutic postures and deep relaxation. Junior Members are welcome, but required to stay on their mat for the duration of class and limit talking or moving in and out of the room during the session. A gentler practice yoga class focusing on breathing, relaxation and meditation movement through softer poses utilizing blocks and props for support. Follows the YOGA description above, but moves at a faster pace. Class covers both Vinysa and Ashtanga flow. The room is heated and fans are not used. Not recommended for members that struggle with rapid changes in body position (from standing to laying, head down below the heart to head up above the heart). Follows the Hatha style of yoga with the assistance of chairs and yoga blocks. Gentle flow.